So the most important meal of the day is Breakfast. It should give you power, motivation, strength and just enough calories. This Granola contains nuts, carbs, calcium and fruits. Well, there are a lot of granola’s out there and i look around on the net a lot and also try to learn more about food on itself. Like why nuts are so good, or why should i add Chia seeds and so on. Although i really like to eat chocolate, i’m aware that too much is no good. I did not add it to this granola. It also reflects your skin. 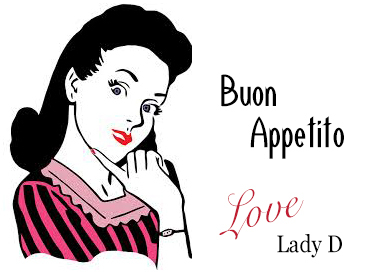 When you eat badly, you will also have a bad skin. It’s a luxury product and is not complete meal.....Chocolate may give a “feel good” feeling............but that’s for a moment. Since i met my husband about 25 years ago, he always eats the same muesli. I could never do that. So i thought of making a worthy Granola >> which means roasted muesli. 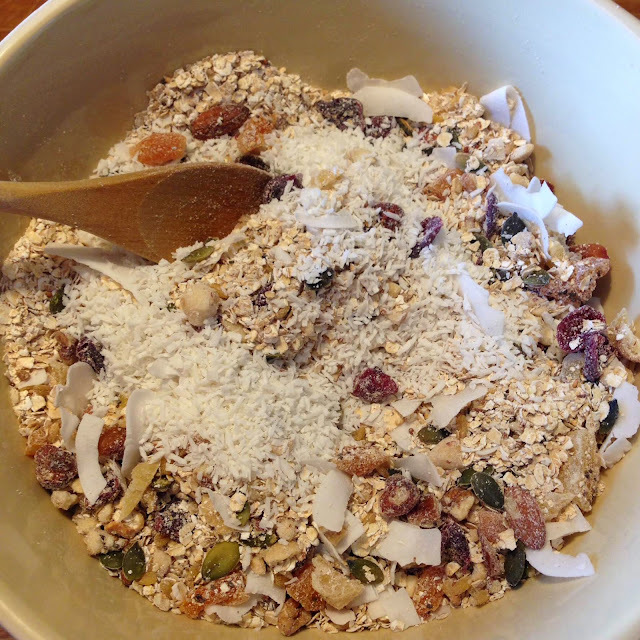 My Granola contains everything you need and i tell you, even at noon you will not be hungry. I eat it with low fat yoghurt and sometimes i combine it with a smoothie. So it’s very versatile in combinations. 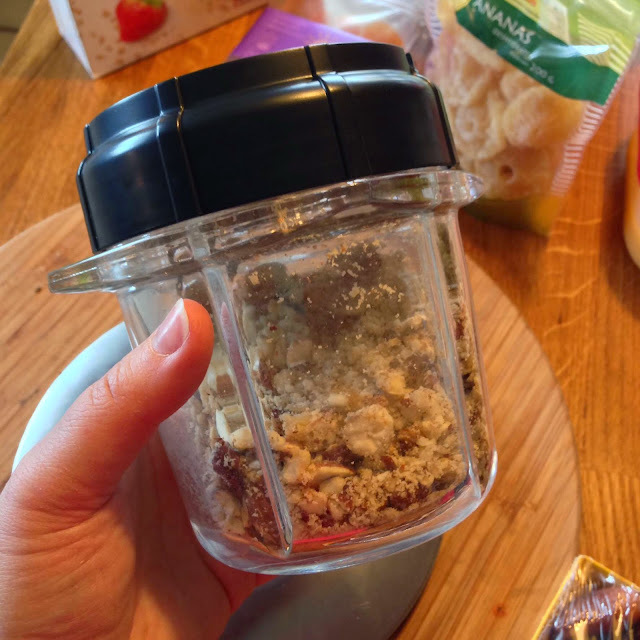 On Picture above my granola is added on top of my smoothie. 1. 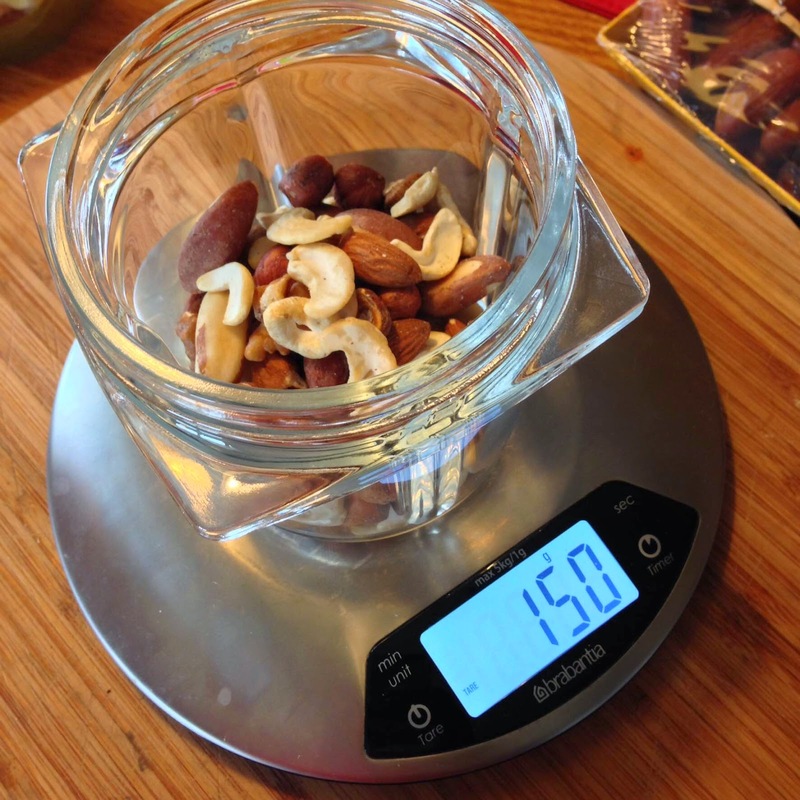 Throw everything together in a bowl, i place my mixing bowl on a scale, so i can measure everything carefully and easy. In fact you only need 1 bowl to make this. 2. I sweeten my granola with homemade apple/mango pureé and not with sugar. 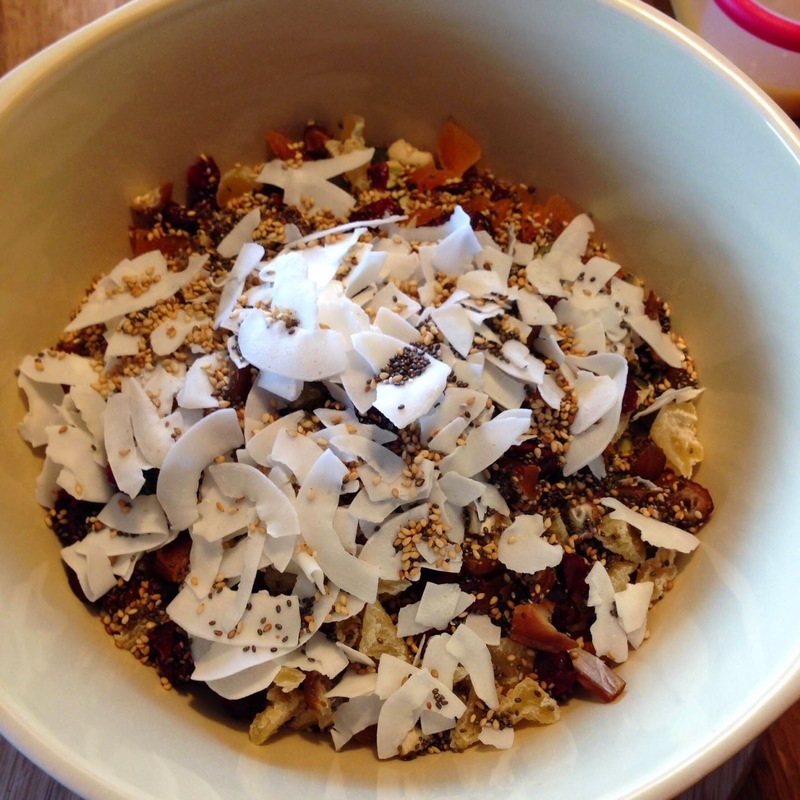 The coconut blossom sugar is also a sweetener, but not enough to cover the complete granola. Besides i like to keep it natural and mango has a sweet taste. 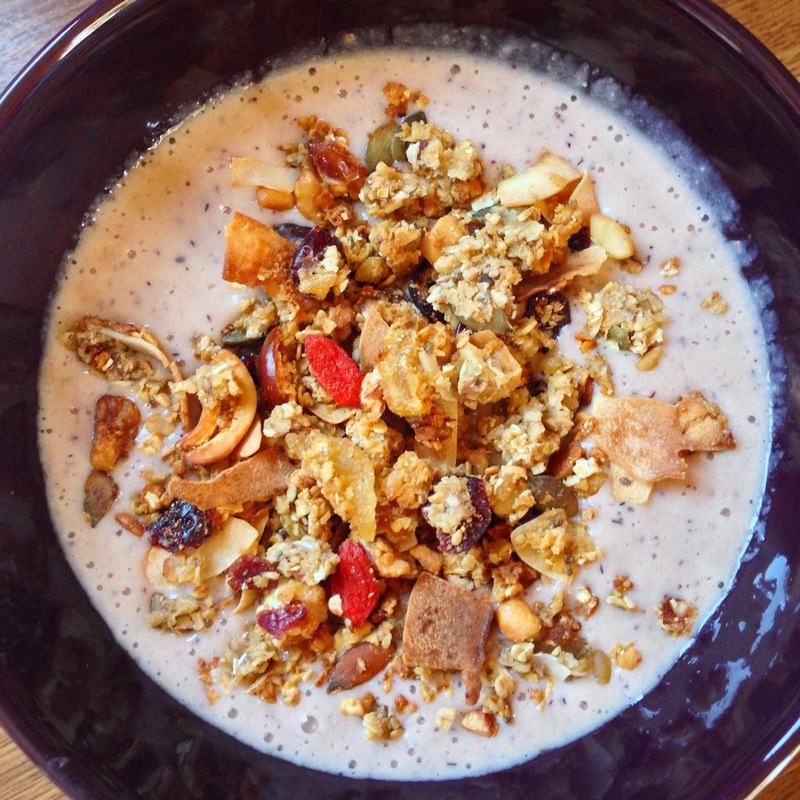 When adding the next pureé, it will make your granola even more crunchy. 1. Remove the skin from the mango and pit. 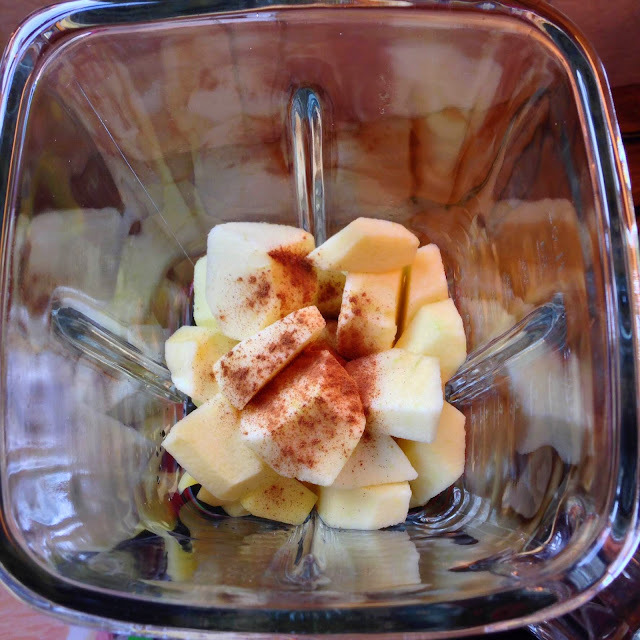 Cut in pieces and place them in the bowl of the blender. Again i use the mini bowl of Magimix. 2. Peel the apples, remove the middle part and cut in pieces. Put them in the bowl as well. 3. Add the honey, cinnamon and some water. Shut the bowl and mix everything. If necessary add some more water when it’s too thick. TIP : When you add some lemon juice, the apples keep their color and not become brown. especially when you keep the pureé exposed to air. This pureé you can use with more recipes. and it’s so good that i mostly start to eat it like that......mmmmmmmm. 1. Add the pureé to your granola and stir well, so all the granola is covered. It even will become sticky, but that’s ok.
2. 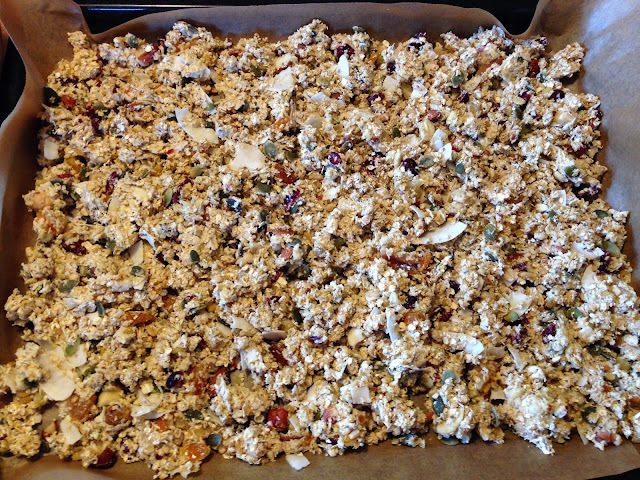 When everything is covered well, add the granola to a baking tray (which is covered with baking paper) and make sure it’s spreaded over the whole tray. 3. Put in a pre heated oven on 180°c for about 30 minutes. You do have to stir it every 5 minutes. Otherwise your granola will only brown on 1 side and the most will be on the back of the tray too. It’s just a half an hour work to keep an eye on it. And do use protection on your hand when you stir in the oven, cause it becomes really hot! The longer the granola is in the oven, you will start to notice it becomes more crunchy. That is what we want. 4. When the 30 minutes are over, or when you realize that it’s brown enough (depending on your oven). You can remove the tray from the oven. Let cool down completely in the tray! 5. 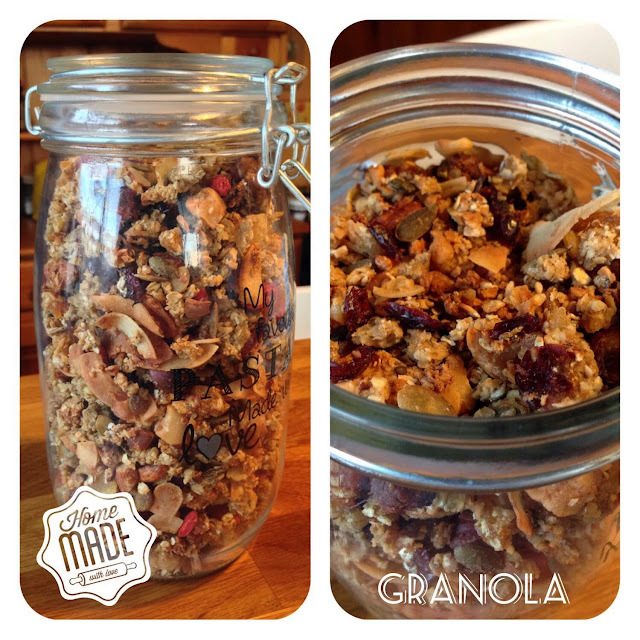 When it’s cold, you can add the granola to a jar with lid and conserve for about 3 weeks. you get this mini bowl for free. Offer is not only for this shop, but everywhere in Belgium.